LA ROMANA, Dominican Republic (Jan. 17, 2019) – Most players at the Latin America Amateur tote golf bags logoed with the name or flag of their home country. It made Carlos Bustos, with his bright royal “Lynn” bag, easy to spot Thursday in the crowd forming around player dining at Casa de Campo. It’s fitting that Bustos would identify himself in this way. After all, he was the man to break a streak of national-title close calls that shrouded Lynn, an NCAA Division II school in Boca Raton, Fla., for seven years. It was a cruel brush with title after title. Four times, inches meant the difference between a national title and yet another runner-up. Bustos, 21, earned Lynn’s clinching point in the medal match-play finale to the national championship, and though it’s a memory he can draw on for confidence, he admitted he didn’t tap into that on Thursday. This week is about individuals, but it’s a switch that’s thrown easily when Bustos enters a team event, particularly with his Lynn teammates. Bustos, from Chile, is one of five Lynn players in the LAAC field this week, and one of four from the 2018 national-title team. There are 58 players with ties (current, former or future) to American colleges in the 108-man field, representing 42 different schools, but nobody claims as many players as Lynn. Bustos falls near the front of the pack with an even-par 72 after one day at the Teeth of the Dog Course. Teammate Jorge Villar, a 20-year-old from Mexico, joined him on that number. Led by Agustin Errazuriz’s 69, all five Lynn players finished 18 holes at 73 or better, which left them within seven shots of the lead. The LAAC is deeply rooted within Lynn’s DNA. To know this team is to know the void that the LAAC fills in this region. Lynn players circle the event on the calendar every year and do whatever necessary to guarantee themselves a spot. Now this team and this tournament connect. Nearly half of the Lynn roster hails from Latin America. When Venezuelan Manuel Torres was recruited to Lynn five years ago, he carried a World Amateur Golf Ranking in the 4,000 range. It was far from good enough to earn him a LAAC berth, let alone a college scholarship. There weren’t many offers on the table, but a friend from Ecuador who currently played for Lynn convinced Torres to send his coach an email. Danna, who took a job as LSU’s assistant men’s coach this fall after six seasons at Lynn, liked Torres' work ethic and brought him on board. It took a year to build up his game, but eventually the tall, lanky player was not only contributing to the team but climbing the WAGR. If Bustos was the closer last spring, then Torres was the MVP. Danna tells the national-championship story magically – and breathlessly – and Torres figures in heavily. He was a senior among underclassmen. It was the youngest squad Danna has ever coached. Lynn met No. 1-ranked West Florida, a team that had a 7-0 regular-season record against the Knights, in the championship match. Toto Gana, a then-sophomore from Chile who famously won the 2017 LAAC, put the first point on the board, with little interference by Danna. “Toto is a grinder, he’s not going to give up. Everyone knows who Toto is -- he’s a star in South America when it comes to golf,” Danna said. Behind that, Torres had a dream round of 66 for a much-needed win in the penultimate match. That left Bustos, in the last match, to secure the winning point. He took the lead with a birdie on the 17th, and both players bogeyed the 18th. Chaos ensued. Gana, 21, is the only past LAAC champion in Lynn’s ranks. As he was winning the 2017 title in Panama, Danna was supposed to be boarding a plane. Gana had three holes left and Danna could stall no longer, so he boarded, anxiously awaiting takeoff so he could return to LAAC coverage. Three hours later, Danna found out that Gana had won. Three months later, Lynn sent a player to Augusta for the first time in history. Gana wasn’t even supposed to end up at Lynn. His path to the University of South Florida in Tampa was rerouted by a low SAT score. If there’s any level of fate involved in Lynn’s national-championship story – as Danna believes – then it must start there. Gana is self-conscious of his English and explains how difficult that made his transition to college in January 2017. More than that, Augusta dreams – real ones formed when Augusta is actually on the horizon – do not make for prime focus and concentration. “It was a hard semester,” Gana said, but he returned. With so much on Gana's plate those first few months, Torres, 22, remembers that but for Gana’s countrymen, few other team members had a chance to get to know him. Despite that, Lynn added another runner-up national-championship finish that spring. By the time the next national championship rolled around in 2018, Gana and Torres were insanely competitive within the huddle. Each tournament was like a head-to-head match, with each gunning to beat the other. Once match play started at the national championship, that rivalry was transferred to an opponent. Torres’ last act at Lynn was a 6-under 66 in the championship match – and he’ll carry that into an upcoming pro career. 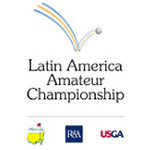 Since May, Torres, who has earned conditional status on the PGA Tour Latinoamerica, has been holding onto his amateur status just for a fourth and final start at the LAAC. “I just know that I can shoot a round when I need it the most,” he said. Post-LAAC, the challenge will be in defending the national title. Even though Torres has graduated, Gana likes what Errazuriz and Guillermo Casares (a freshman from Mexico who is not at the LAAC) bring to the program. So does current head coach Andy Walker. There’s a similarity between Gana and Errazuriz that you can’t miss. The younger Chilean will be a first-semester freshman when he returns from La Romana. Why Lynn? Family. And he hasn’t even started. Gana made his LAAC debut at Casa de Campo in 2016, so he carefully laid out some advice for Errazuriz, playing his second LAAC this week. You have to be patient here and play smart. That helped Errazuriz hit 16 greens for the opening 69 that left him T-2 after the first round, the best standing among the Lynn contingent. Having been in a position to reap the spoils of a LAAC win, Gana is in a little better position to articulate just what the opportunity means. He communicates that, too. Thanks to Gana, Bustos understands a little better than most. Bustos, a classmate, went along to Augusta in 2017 to watch his friend play. They’ve been friends since they were 5 years old. Bustos has celebrated other Chilean-won LAAC titles and called it a pleasure to watch so many of his countrymen win this event. But there’s another sentiment, too.